Your own home is a very special place no matter how old you are. Whether it's an apartment, condo or house, your home is a safe place where you can take your shoes off, relax and be yourself. Home is filled with familiar furnishings and memories – a comfy, cozy chair, your grandmother's antique dresser, and family photo albums. You know just where the bathroom is and can almost find it in your sleep! Receiving a diagnosis of dementia can be frightening for the patient and for their loved ones. If the disease is diagnosed in the early stages, there are things you and your loved one can do to mitigate the effects while they are still able and ensure they have a voice in their care. Exchanging thoughts, feelings, and desires with others is an essential part of the human existence. It’s one way we remain connected to each other. But for your loved one with dementia, it becomes more challenging as the condition progresses. Keeping a line of communication with your loved one is important, no matter how difficult it becomes. How will you tell your loved one that he or she has been diagnosed with Alzheimer’s disease? 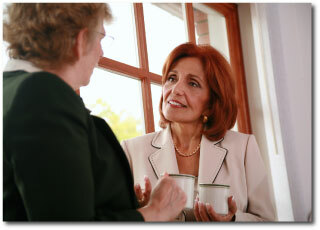 This task is no simple matter; however, it is one you should pursue as a caregiver and as a loved one yourself. ad clinical trials: should your loved one participate in an alzheimer’s clinical trial? As a caregiver for an older adult with Alzheimer’s Disease, you may wonder if having him or her join a clinical trial would be a good idea. Caring for a loved one needs to be more than just taking care of his or her physical health. Caregivers and those being cared for should also experience a personal connection and enjoy being together. Tube feeding and IV hydration are issues your family may face as your loved one enters the late stage of Alzheimer’s disease. Alzheimer’s patients and those with severe dementia may forget how to eat, refuse to eat, be unable to swallow, or unable to use the reflex that allows them to swallow. Your loved one’s health care professionals may suggest tube feeding. When your loved one reaches the late stage of Alzheimer’s disease, his or her body will need extra care and attention. As Alzheimer’s and dementia patients age, they may lose their ability to move about freely and become bedridden. This level of immobility can lead to many maladies or co-morbidities, including one of the most troubling, a pressure sore. It is not uncommon for a person with Alzheimer’s to repeat the same question, or tell the same story over and over again. It is also not uncommon to feel annoyed, and frustrated by this behavior. Being with someone who repeatedly asks the same question, paces around the room, or hums a tune constantly can be hard to deal with. Genetic testing is a practice which is becoming more and more common for people looking to learn whether they are genetically predetermined to inherit certain diseases. Studies and technology have combined to help people prepare for the possibility that their lives will follow a certain course. These sorts of testing can alleviate uncertainty in those individuals who could inherit certain diseases. Is there testing available for those individuals who suspect they or their loved ones may be stricken with Alzheimer’s Disease? As your loved one reaches the end stages of Alzheimer’s disease, the care needed intensifies. At this point, your loved one will be totally dependent on you for care and unable to remember much of his or herlife. You’ve heard people talk about hospice care, but may not know exactly what it all entails, and how it relates to Alzheimer’s patients. As humans we have the instinct to nurture. We want to show affection, to give love, and to receive love. That need doesn’t go away, even as memories deteriorate with dementia. The kitchen is the heart of most families’ homes. Now that you have a family member with dementia, you want to keep the kitchen as safe as it can be. Here is a list of 10 popular, authoritative, and readable books for caregivers on Alzheimer's and memory loss caregivers can borrow from public libraries or purchase for their own use. People with Alzheimer's disease often experience sleep disorders – especially as the disease progresses. Sleep problems affect not only their own health but also the well-being of their caregivers whose own sleep is frequently disrupted by their parent's nighttime wakefulness. Understanding how and why sleep problems occur can help you develop strategies that will help everyone in your household enjoy a good night's sleep. For older people who grew up during the Great Depression, food was plain and filling. They didn't have many food choices and considered themselves lucky to have bread and gravy, home-grown fruits and vegetables, Wonder Bread and bologna sandwiches to eat. Meat was often served only on Sundays. "If we didn't like what was on the table we just had to do without." they'll tell you. When an older parent is diagnosed with Alzheimer's disease families are often determined to help find a cure for this dreaded disease. One way caregivers they can help make a cure a reality is by volunteering to participate in Alzheimer's research studies. Alzheimer's is a difficult disease for almost anyone to understand. People with memory disorders can behave in ways that are frightening and confusing for children. Grandpa doesn't act the way he used to. He may not even remember his grandchildren's names. Your child's world is disrupted if you are responsible for looking after the needs of an older relative with Alzheimer's. Activities are an important part of life for people with dementia, Alzheimer's or other memory conditions. Keeping busy provides much-needed structure to your relative's day and helps him or her feel like a productive member of the family. Enjoyable activities prevent boredom and help maintain basic living skills.